Level 2 Catering and Hospitality student, Chelsea Jones, serving Deputy Lieutenants. Barnsley College played host to the annual luncheon for the Lord Lieutenant and Deputy Lieutenants of South Yorkshire incorporating a very important message within the menu. 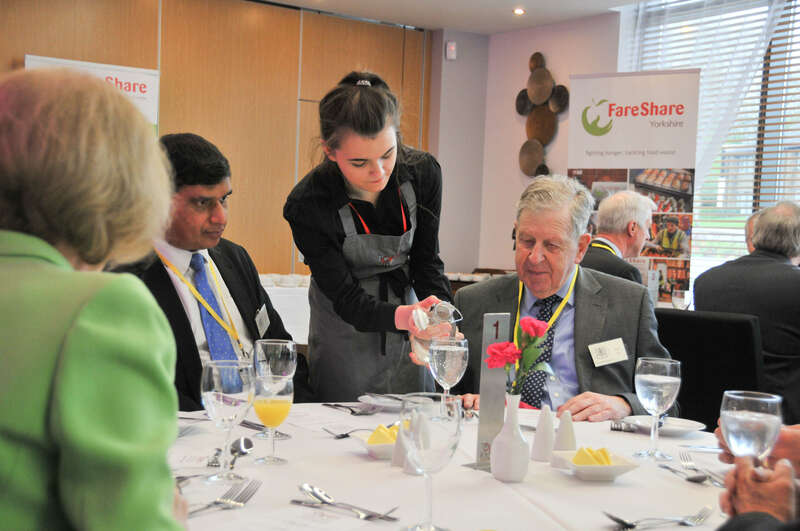 In collaboration with FareShare Yorkshire, a charity which redistributes surplus food to prevent it becoming waste, and Company Shop, the UK’s largest distributor of surplus food, the college’s Catering and Hospitality department cooked up a three-course meal with the donated produce. Each element of the menu was created with the surplus food including the table water, meat, fruit and vegetables, right down to the condiments used to flavour the dishes. Level 2 Catering and Hospitality students were faced with the challenge of receiving the food just days before the event and coming up with a menu fit for the dignitaries. The chosen menu was a culinary success that consisted of an assiette of chicken, sirloin of beef with ox cheek tortellini, deconstructed season fruit cheesecake, followed by an artisan cheese board. Martyn Hollingsworth, Catering and Hospitality Course Leader, led students with other members of the department to make sure that every aspect was covered from the creation of the menu, organisation of students in the kitchen and on the floor serving dishes, down to the co-ordination of clearing away. He said: “We were delighted that the Lord Lieutenant and the Deputy Lieutenants wanted to host their luncheon at the college. Our students have gained so much from this experience; 100% of the dinner came from surplus food and was saved from landfill which opened their eyes to food waste and the amazing things that can be done with it. Dr. John Foster MBE, Deputy Lieutenant and Managing Director at Fosters Bakery, added: “The college managed our event with utmost professionalism, with a friendliness that typifies the people of Barnsley and a spirit that complemented the aims of the conference. “I don’t know of any other organisation capable of handling all the requirements we set including creating such a quality menu out of just surplus food that was otherwise heading for landfill. Gareth Batty, Chief Executive Officer of FareShare Yorkshire, attended on the day to help raise awareness of food waste and how the organisation is working to tackle poverty in the UK. He said: “It was a real privilege to support the Lord Lieutenant’s luncheon. It was a great way of raising the awareness of surplus food and demonstrating how we work hard to turn food that would otherwise be wasted into social good.